Hamas, the Palestinian movement that runs Gaza, has re-elected Khaled Meshaal as its political leader, several sources inside Hamas confirmed to CNN Tuesday. 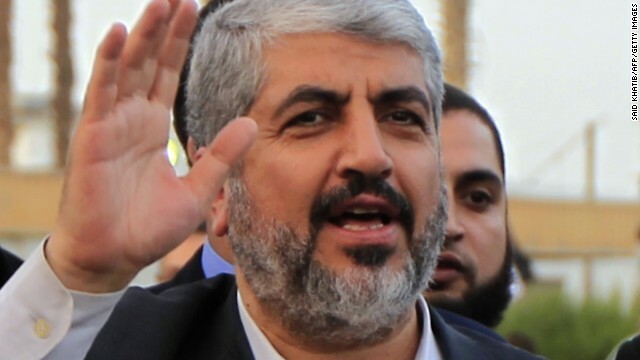 Meshaal (pictured) was re-elected as chairman of the Hamas Political Bureau in Cairo on Monday. Hamas Prime Minister Ismail Haniya will continue to lead the movement internally inside Gaza. U.S. President Barack Obama visited the West Bank on Thursday, stressing the need for direct talks between Israelis and Palestinians for a two-state solution. "The Palestinian people deserve an end to occupation and the daily indignities that come with it," Obama said at a news conference with Palestinian President Mahmoud Abbas. "Palestinians deserve a future of hope," he said. "Palestinians deserve a state of their own." President Barack Obama is visiting Israel, Jerusalem and the West Bank for the first time since he became president. He and Israeli Prime Minister Benjamin Netanyahu held a joint news conference Wednesday evening in Jerusalem. [Update 3:16 p.m.] The news conference has concluded. [Update 3:15 p.m.] Netanyahu said the United States and Israel have a "common assessment" on Iran's progress in developing a nuclear weapon. [Update 3:09 p.m.] Obama said that he "purposely did not want to come here and make some big announcement that might not match up to the reality" on the ground regarding the Middle East peace process. [Update 3:04 p.m.] "I think there is time to resolve this issue diplomatically," Obama said about tension over Iran's nuclear program. [Update 2:56 p.m.] Obama said that "all options are on the table" regarding Iran's nuclear ambitions, adding that "we will do what is necessary in preventing Iran from getting the world's worst weapons." Netanyahu said he was "absolutely convinced" that Obama is "determined to prevent Iran from getting a nuclear weapon." [Update 2:52 p.m.] Obama said he has ordered an investigation of whether the Syrian government used chemical weapons against its own people, adding he was "deeply skeptical" of any claim the opposition had used them. "Once we have established the facts, I have made clear that the use of chemical weapons is a game-changer," Obama said, stopping short of saying what he would do if Syria had crossed his "red line" for stronger action. [Update 2:49 p.m.] Obama said the Syrian government's "use of chemical weapons against the Syrian people would be a serious and tragic mistake," adding that Damascus "will be held for accountable for the use of chemical weapons or their transfer to terrorists." [Update 2:45 p.m.] Obama said he and Netanyahu discussed extending U.S. assistance for Israel beyond the 2017 deadline of the current agreement between their countries. [Update 2:42 p.m.] Netanyahu said Wednesday that he hoped the visit by Obama and Secretary of State John Kerry can "help us turn a page in relations" with Palestinians seeking their own state. [First post 2:38 p.m.] Netanyahu said Wednesday that diplomacy and sanctions have not stopped Iran's efforts to develop a nuclear weapon so far, adding that a peaceful solution also requires a clear and credible threat of military action. President Barack Obama departed Joint Base Andrews Tuesday evening aboard Air Force One for his first visit to Israel and the West Bank since he became president in 2009. Iran is the top issue as Obama heads to Jerusalem for meetings with Israeli officials, including President Shimon Peres and Prime Minister Benjamin Netanyahu. The prime minister has at times voiced concerns Washington has a less urgent view than Israel of Iran's progress toward developing a nuclear warhead. But Netanyahu has welcomed the administration's more muscular language of late that "all options" are on the table and that its policy is to prevent - not contain - a nuclear Iran. 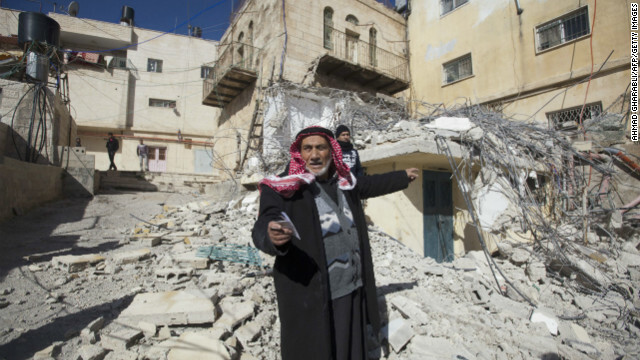 A Palestinian man points toward a home demolished by Israeli bulldozers in Arab East Jerusalem on January 15. Israeli settlements have taken a "heavy toll" on the rights and sovereignty of Palestinians, a U.N. report said Thursday. The U.N. Human Rights Council report ticked off a range of rights it says have been consistently violated in the West Bank and East Jerusalem during what it calls "creeping annexation" by Israel. 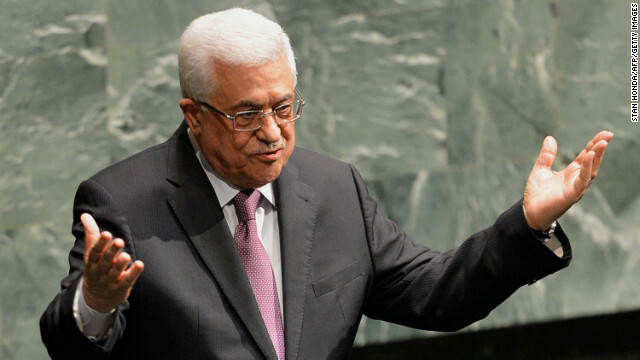 Palestinian Authority President Mahmoud Abbas after he spoke to the United Nations General Assembly in November. Palestinian Authority President Mahmoud Abbas has signed a decree changing the name of the Palestinian Authority to the "State of Palestine," according to the organization's official news agency. According to the decree, official stamps, signs and official letterhead will be changed and hold the new name of "the State of Palestine." Palestinians have long been pushing for official statehood. It was granted "nonmember observer state" status after a vote at the United Nations vote in November. If you're confused about whether something similar to this has already happened, you can read our explainer, that gives details about what the recent Palestinian moves mean. The United Nations General Assembly on Thursday endorsed an upgraded U.N. status for the Palestinian Authority, despite intense opposition from the United States and Israel. The resolution elevates their status from "non-member observer entity" to "non-member observer state," the same category as the Vatican, which Palestinians hope will provide new leverage in their dealings with Israel. Palestinian leaders had been working with dozens of supporting nations to develop a formal draft, enlisting the backing of European countries such as France and Spain. Germany abstained from the vote. A fragile truce between Israel and Hamas appeared to hold amid reports Friday that Israeli troops opened fire near the Gaza border, killing at least one Palestinian and wounding 19, Hamas security and health officials said. The shooting happened east of Khan Younis, a border city in Gaza, when a group of protesters and farmers approached the 300-meter "no man's land" between Israel and Gaza, according to Hamas security officials, who spoke on condition of anonymity. 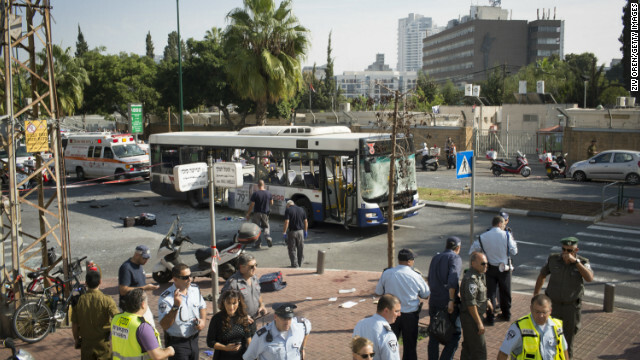 An arrest has been made in Wednesday's bombing in Tel Aviv of a bus, an Israel Defense Forces spokeswoman Thursday. "He is an Arab-Israeli from Taybe & was a member of Hamas," said the spokeswoman, Avital Leibovich, in a Twitter posting about the attack, in which 24 people were wounded. Taybe is a village in the West Bank. Israeli police said that the bomb was detonated by a cell phone and that the suspect was from Ramallah on the West Bank. A bomb exploded on a bus in Tel Aviv as it passed by Israeli army headquarters around noon local time Wednesday. #Gaza victory party petering out, people going home. I can hear the drones again. The talk in Washington is all about the "fiscal cliff" and what the president and Congress need to do to avoid it. Watch CNN.com Live for continuing coverage of the fiscal cliff debate. A bomb exploded on a bus in Tel Aviv as it passed by Israeli army headquarters around noon local time Wednesday. The attack, which police said left at least 22 people injured, shook up the Israeli public and threatened to complicate efforts to achieve a cease-fire on the eighth day of violence between Israel and Gaza. At the scene of the bus bombing, police cordoned off the street as ambulances arrived. CNN's Sara Sidner said there is a hospital nearby. Sidner said the injured included people on the bus and people who were on the street. U.S. Secretary of State Hillary Clinton met with Israeli Prime Minister Benjamin Netanyahu in Jerusalem for more than two hours to discuss the ongoing violence between Israel and Hamas. "They discussed efforts to de-escalate the situation and bring about a sustainable outcome that protects Israel's security and improves the lives of civilians in Gaza," according to a state department spokeswoman. Clinton is headed next to Ramallah, to meet with Palestinian Authority President Mahmoud Abbas, and then to Cairo, where she will meet with Egyptian President Mohamed Morsy. Israel has completed its planning and is prepared to go ahead with a ground invasion into Gaza if necessary, the Israeli ambassador to the United States said Monday. Michael Oren underscored that Israel would like to avoid a ground operation, but is ready to act if needed. The ambassador spoke to reporters at a briefing at Israel’s embassy in Washington. Pressure is mounting for an end to the Israeli-Palestinian violence that has left dozens dead and hundreds wounded, with the U.N chief flying to the region to appeal for a cease-fire. Meanwhile, the head of Egyptian intelligence has given an Israeli delegation a letter for Prime Minister Benjamin Netanyahu containing Hamas conditions for a cease-fire, a general in Egyptian intelligence told CNN. There was no immediate confirmation from Israel. President Barack Obama called Egyptian President Mohamed Morsy on Saturday to discuss the ongoing violence in Gaza. Egypt's intelligence chief is spearheading talks with Hamas and Israel to forge a stop to the three days of warring that has engulfed Gaza and the Jewish state and head off an Israeli ground offensive into the besieged Palestinian territory. Obama praised Egypt's efforts to de-escalate the situation, and said he hoped they worked. He also expressed regret for the loss of civilian lives. Israel's Cabinet on Friday approved the activation of up to 75,000 reservists given the conflict, said the spokesman for the prime minister. Israel's military said earlier in the day that 30,000 troops are being mobilized for a possible move into Gaza. Rockets landed near Israel's two most populous cities as fighting between Israel and Hamas militants persisted with no immediate end in sight. 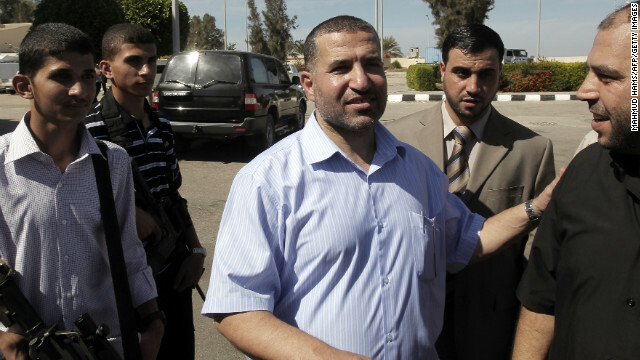 Hamas military wing leader Ahmed Ja'abari is seen on the Egyptian side of the Rafah border crossing into Gaza on October 18, 2011. Ahmed al-Ja'abari, head of Hamas' military wing, was killed Wednesday in Gaza by an Israeli "surgical" strike, the Israeli military announced. A spokesman for the Hamas-run government in Gaza confirmed that al-Ja'abari was killed in an Israeli strike. "Israel is announcing the war in Gaza and Israel will carry the responsibility for killing Ahmed Jabri," Tahar Eanono said in a written message. Militants in Gaza have been firing dozens of rockets into southern Israel, and Israel has struck back. The IDF has begun a widespread campaign on terror sites & operatives in the #Gaza Strip, chief among them #Hamas & Islamic Jihad targets. See our full coverage of today's events here. [Update 12:44 p.m.] The Israeli military says more than 85 rockets from Gaza have hit Israel since yesterday. "In the past two days, Palestinian terrorists in the Gaza Strip have dramatically escalated their attacks against Israel — firing an anti-tank missile at an IDF jeep as well as launching barrages of rockets at Israeli civilians," the Israel Defense Forces says. The Palestinian official news agency WAFA posted this photo, saying it was taken in Gaza today after an Israeli strike. WAFA did not give an exact location. Israel has said it targeted a rocket-launching squad in Gaza. This photo shows Israelis running for cover as a siren wailed in the city of Ashkelon in southern Israel, warning people of more rocket attacks coming in from Gaza, on Saturday night.